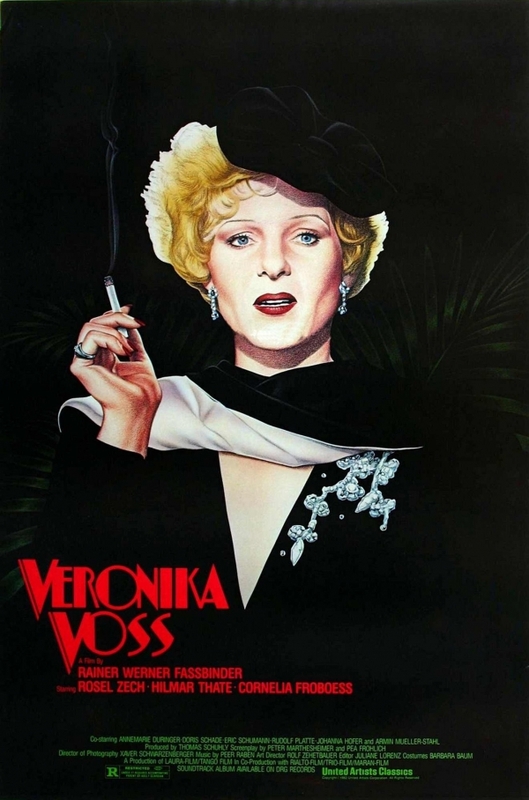 Veronika Voss was the penultimate film made by controversial German director Rainer Werner Fassbinder before his death at the young age of 37 in 1982. In light of the man’s inclement drug overdose, thus ending a controversial and colorful career within his native country, the film and its tragic story of its titular character are often thought to be referential to Fassbinder himself. Whether or not Fassbinder recognized or intended the resemblance between himself and his characters is unknown, although it is hard to doubt this film, the final one of his to be released before his death, does not offer a window into his psyche like the films of so many auteur filmmakers. Certainly, the similar causes of both their demises are uncanny. In many ways, Veronika Voss is like Ingmar Bergman’s classic Seventh Seal (1957) in that it bears more resemblance to the black-and-white silent films and classic Hollywood talkies of the ’30’s and ’40’s than many of the European and American New Wave films that followed. Where as many films from the early ’60’s onward sought to break the 4th wall barrier between the movie-world and the audience, calling attention to the actual construction and self-awareness of the cinematic experience, films of Hollywood’s Golden Age preferred styles of “invisible storytelling,” filmmaking that sought to absorb moviegoers completely into the film’s world and make them forget they were even watching a movie. Voss is much like the latter description, or at least it feels so to me, telling a straight-up, no-funny business cinematic tale of the last days of a legend’s fall from grace. The titular character, Veronika Voss, played by a strong Rosel Zech, is an aging Nazi-era movie star way past her prime who draws the attractions of an average joe, Robert Krohn (Hilmar Thate). We share points of view between these two as their relationship develops, and slowly but surely Krohn discovers more about the seedy, desperate, and ultimately tragic lifestyle of the acting legend as she succumbs to her personal demons. The creepy mystery behind Voss’ ailments adds interesting, unsettling depth to the otherwise traditional fall-from-grace tale. Inevitably, Voss is shown to be a much more interesting character than her lover, but the developments of a criminal plot paired with Krohn’s strong-willed determination to drive the story forward rarely lets things get stale. As a whole, the screenplay paints an interesting portrait of memorable cast of characters. I was somewhat less impressed with the old-school directing style by Fassbinder, which didn’t wow me at any point during the movie. Perhaps there’s a good degree of German New Wave cinematographic detail I’m missing (which there often is with these older foreign dramas whose broad film movements I’m merely sampling), but for the most part I didn’t see anything too extraordinary in the filmic presentation of this narrative. In general, I’m also not a big fan of post 1950’s films in black-and-white unless I feel the director has demonstrated a good artistic reason for it, which I don’t see here. It’s not that the overall look of the film is bad by any means, it just lacks any sort of cinematic punch or visual flavor other than a strongly bleached, whiteout look. Annemarie Duringer (right) makes for a wicked villain. If you’re a fan of German cinema, Fassbinder is a big name to know, and Voss is considered one of his best. My advice is don’t expect a riveting, edge-of-your-seat viewing experience unless you really like these throwback dramas. It’s altogether a somewhat strange yet familiar take on an unsettling narrative arc. SUMMARY & RECOMMENDATION: Fassbinder’s screenplay is an interesting take on the Sunset Boulevard (1950) archetype of a star’s spiritual decay. The titular character’s supporting cast is less interesting, but Krohn does his best to add urgency to the detective subplot of the story. — However… judging by this one example, I’m not an immediate convert of Fassbinder’s directorial control, although I’m well aware the man was a legend in his time (or at least after international media came to a consensus on his work). The black-and-white feature didn’t win me over either.